New York, USA -- Only three months after U.S. armed forces killed Osama bin Laden in the countryside of Pakistan, and almost 10 years after the al Qaeda attack on 9/11, the Upper East Side's Asia Society wants to challenge New Yorkers to see Pakistan's history in an entirely new light. When Asia Society's new exhibit "The Buddhist Heritage of Pakistan: Art of Gandhara" opens on Tuesday, museum-goers will have a chance to see Buddhist sculptures, architecture and other art works made from gold and bronze from the ancient area of Pakistan that have never been on view in the United States. The exhibit is the first of its kind in nearly 50 years, according to a musuem spokeswoman. It was significant that the art was made available to an American museum in light of the the recently strained alliance between the two countries after bin Laden's assassination, Asia Society Museum Director Melissa Chiu said. “Against a backdrop of political turmoil and tensions in the U.S.-Pakistan relationship, securing these loans has been an extraordinary achievement,” says Chiu, who is also vice president of the Global Art Programs. The exhibit is separated into three sections: "Classical Connections," "Narratives and Architectural Context" and “Buddhas and Bodhisattvas." 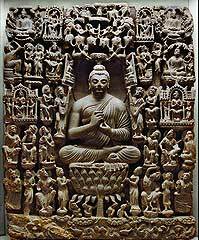 It shows the influence of Greco-Roman culture on the area's artwork, scenes of Buddha's life and the multi-faceted nature of the religious figure as he was represented in Pakistan. Chiu hopes that these 70 works that have been so carefully preserved might give New Yorkers more insight into Pakistani culture. “Despite images of Pakistan as a place of violent extremism, the region has an ancient tradition of tolerance and pluralism as evidenced by the survival of these spectacular examples of Gandharan art," she said. The majority of the works are on loan from Pakistan's National Museum in Karachi and the Lahore Museum in Lahore. At its height, Gandhara encompassed areas in Afghanistan and northwest India. "Through this exhibition, Asia Society aims to provide new contexts for looking at the arts and culture of Pakistan today, in keeping with our long history of programming about and engagement with the region," Chiu added. The Buddhist Heritage of Pakistan: Art of Gandhara will be on view August 9–October 30 at the Asia Society Museum, located at 725 Park Avenue on 70th Street.